God o the Grape Harvest, Winemakkin, Wine, Ritual Madness, Releegious Ecstasy, Growthiness an Theatre. Dionysus (/daɪ.əˈnaɪsəs/; Greek: Διόνυσος, Dionysos) is the god o the grape harvest, winemakkin an wine, o ritual madness, growthiness, theatre an releegious ecstasy in Greek meethologie. 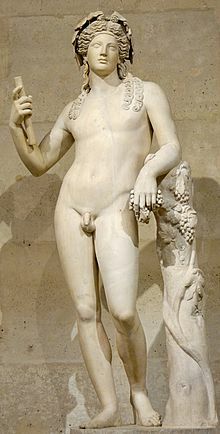 Alcohol, especially wine, played a important role in Greek cultur wi Bacchus bein a important raison for this life style. His name, thocht tae be a theonym in Linear B tablets as di-wo-nu-so (KH Gq 5 inscription), shows that he mey hae been wirshippit as early as c. 1500–1100 BC by Mycenean Greeks; ither traces o the Dionysian-teep cult hae been foond in auncient Minoan Crete. His oreegins are uncertain, an his cults teuk mony shapes; some are describit bi auncient sources as Thracian, ithers as Greek. In some cults, he arrives frae the east, as an Asiatic foreigner; in ithers, frae Ethiopie in the Sooth. He is a god o epiphany, "the god that comes", an his "foreignness" as an arrivin ootsider-god mey be inherent an essential tae his cults. He is a major, popular figur o Greek meethologie an releegion, an is includit in some leets o the twal Olympians. Dionysus wis the last god tae be acceptit intae Mt. Olympus. He wis the youngest an the anerly ane tae hae a mortal mither. His festivals were the driving force behind the development of Greek theatre. He is an example of a dying god. ↑ Gately, Iain (2008). Drink. Gotham Books. p. 11. ISBN 978-1-592-40464-3. ↑ Raymoure, K.A. (November 2, 2012). "Khania Linear B Transliterations". Minoan Linear A & Mycenaean Linear B. Deaditerranean. "Possible evidence of human sacrifice at Minoan Chania". Archaeology News Network. 2014. Raymoure, K.A. "Khania KH Gq Linear B Series". Minoan Linear A & Mycenaean Linear B. Deaditerranean. "KH 5 Gq (1)". DĀMOS: Database of Mycenaean at Oslo. University of Oslo. ↑ Sacks, David; Murray, Oswyn; Brody, Lisa R. (2009-01-01). Encyclopedia of the Ancient Greek World. Infobase Publishing. ISBN 9781438110202. Retrieved 20 April 2013. Seaford, Richard. Dionysos (Gods and Heroes of the Ancient World). Oxford: Routledge, 2006 ISBN 0-415-32487-4. Wikimedia Commons haes media relatit tae Dionysus. This page wis last eeditit on 12 Januar 2017, at 23:08.